First of all, I have to apologise for the lack of posts over the past few months – it won’t happen again I promise! So what stopped me? I am putting the finishing touches on a project that I’ve been working on all winter and that has taken up a large proportion of my time. In addition to this, I wasn’t catching anything and I didn’t feel comfortable writing posts about ‘how’ to catch bass until I started to catch them again myself. Without a doubt, the cold winter and spring we’ve experienced has held nature back in general. There were periods during April when the sea state conditions and tides were absolutely ‘spot on’ or at the very least highly conducive to producing fish. In previous years, even when it’s remained on the cool side for April, I have caught them from early April onwards (or even late March such as a client fish from last year here) but not this year – they simply weren’t there. I fished quite hard in and around certain marks that normally produce early in the season, but it wasn’t to be and you can’t catch what isn’t there. I recall being out on my own fishing in darkness in what I know are ‘perfect’ conditions for a certain reef mark, when the only fish I caught (in 1ft of water, 5 metres out) was a pollack smaller than the lure I was using – I packed up and returned home not long after… Why you ask? Because in my mind, if that tiny fish (and I suspect there were others) was the number one predator(s) on that particular reef, at that particular time then there is no way there were any bass present or likely to be – as that/those pollack would have been easy be prey to a hungry bass and for it/them to feel safe enough to be where they were speaks volumes. There were near misses around that hot spell of weather we enjoyed between the 19-21 April. A client had a decent bass ‘follow’ a surface lure almost to our stance and I lost a half decent bass late on the evening of the 21st just as it was about to reach the shingle (quite how a 6/0 single hook pulled out is hard to explain). A friend fishing in April on the hunt for an early season bass. A couple of days ago he landed his personal best! Slowly but surely, reports began to filter in on Social Media – mostly small bass taken from estuaries but the open coast remained extraordinarily quiet. A former client and now fishing companion George started to catch on his patch (an estuary mouth) using the 27g Savage Gear Line Thru Sandeel therefore, on the 29th April I decided to join him for a session, whereby we managed 10 small bass between us. He’s subsequently gone on to catch bass up to 60cm which is fantastic. Another friend sent me an image of an immature mullet he’d caught in a net from a rock-pool, and I began to find the odd peeler crab amongst the intertidal zones that were utterly teaming with life – gobies, rockling, suckerfish, prawns and the like. There were reports of bass being spotted in gullies (by day and night) and even sandeels. All the signs were pointing towards the notion that it could ‘switch on’ at any moment – the switch just needed to be flicked! I guided a returning client (Mark) on the evening of the 3rd of May. 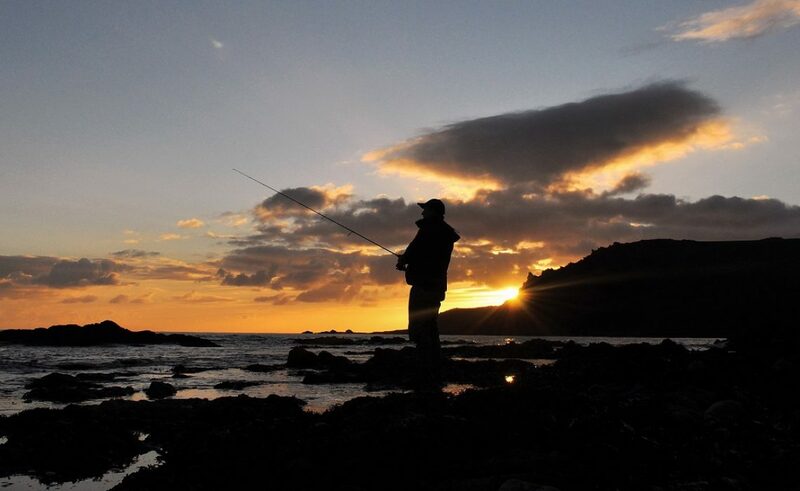 With high tide occurring just before darkness he fished the final 4 hours of the flood in fantastic conditions – a slight swell washing aerated water around the rocks, moderate-good water clarity (ideal) and an overcast sky that obviously became duller as dusk approached. I was expecting him to catch a bass, and the seal that came to say hello also thought he was in with a chance (it soon disappeared however) and even well into darkness he didn’t receive a touch. I must admit, I was really beginning to scratch my head – where were they? As I donned my waders and jacket I looked around the cliffs and out to the horizon – it felt different… The air, the shoreline, the whole environment – it felt like it should for the first time in a very long while. So here I was, on one of my most productive night marks where previous clients have caught bass over 5lb and up to 8lb here and here. As it’s only a cove no more than 100 yards wide I refrained from making a cast until it was properly dark – around 2130. Commencing with a white 5″ senko here I moved with intention along the shingle beach, that would see the lure travelling over some lovely snaggy ground with large rock-pools and channels under 2-3ft of water. Within 10 minutes there was a BANG on the rod tip but no positive hook up – small bass were my thoughts but it all looked positive. Around 10 minutes later without any further action I began to wonder if the fish were slightly further out therefore, I attached an old favourite and my ‘item of the year from 2017’ here a Jim’s Lures Needlefish here. First cast (as is so often the case) and the rod was pulled down with a good THUMP! It wasn’t huge, but it was most definitely a step in the right direction and seemingly, one night they weren’t there, yet the next night they were – you could almost sense that this was the case on this beautiful evening. Small but perfectly formed – a welcome bass from one of my ‘banker’ marks. 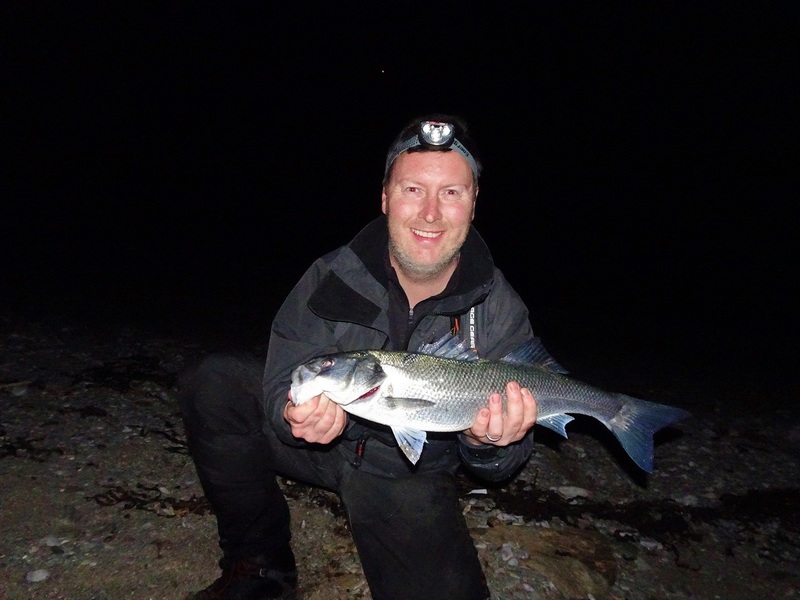 The following night produced two more bass – one on a needle fish approximately 45 minutes before high tide and then a slightly bigger one 45 minutes into the ebb. The second fish hit another very consistent ‘night time’ lure – the Maria Squash F95 here that I like to use when there is very little ambient light. The Maria Squash F95 – A lure that I have total faith in during darkness. Despite only weighing 10g they absolutely ‘fly’ and swim in a very subtle manner only inches below the surface. Scoffing down my dinner in eagerness to head out onto the coastline, I just had a feeling that tonight was going to produce a better one. The day had been very warm and by now the sea was as flat and as calm as it can possibly get – conditions that definitely encourage bass to venture and explore in increased numbers at night. I was stood in exactly the same mark, casting in and around the same features as the previous nights. Around 20 minutes after it became dark I hooked a small one – OK, where’s your Mummy I’m thinking… A further 20 passed therefore, I moved about 20 metres along the shingle in order to target another ‘pool’. First cast, and I’m sure I felt the needlefish being ‘bumped’ (this occurs when I believe a bass attempts to ‘slash’ at the lure). Another long cast (60m) and about 3-4 seconds into the retrieve and SLAM the rod pulled over and the fish began to take line. I could feel every shake of it’s head and turn of it’s body alongside a couple of short attempts to swim towards the beach (a sure sign that it’s a better one). I inched it in gingerly, in the knowledge that this was the bass to really start my season. I flicked on my head-torch and about 20m out in the gloom it was there thrashing on the surface. Gradually tiring, I maintained constant pressure on the fish (and the hook hold) until she slipped onto the shingle – Yessssssss! This 59cm (around 5lb) really wanted the lure judging by the way the rod was wrenched downwards. Larger bass will, more often than not, side swipe the lure and hook themselves on the treble situated in the middle of the lure. I was relieved to see this one hit the shingle I can tell you! The next two nights produced some nice bass in the 4lb range interspersed with some smaller ones. All the bass I managed were caught on the needlefish despite trying senkos and diminutive shallow diving lures although a friend of mine caught his PB (a lovely 57cm bass) on an Pearl coloured Albie Snax. I am chuffed to bits for him as he fished most of last Autumn, through that brutal winter and into this harsh spring – so he certainly deserves it. Interestingly, and like clockwork, all of the bass were hooked within a relatively short window approximately 20-40 minutes before high water and 30 minutes-1 hour into the ebbing tide and within an area no larger than a tennis court. It is working out these specific periods in the tide and finding those very precise zones along the coastline that is the really hard work. But when you’re catching these marvellous creatures with the sea lapping your boots under a starlit sky it makes it all worth it. A 4lb plus bass that grabbed the ‘needle’ in very shallow water (18″) before heading for an underwater ledge. Knowing every inch of the ground in front of you is so important – both from a finding the fish and getting them in perspective. Fishing with the needlefish couldn’t be simpler. They can be cast long distances (covering more ground) and are weighted in such a way that they sink slowly (30cm per second roughly) and horizontally (level sinking) and will ascend when you commence the retrieve. From this point, just keep the rod tip up at between 30-45 degrees and turn the reel handle at one full turn per second. This can be sped up gradually during a session to two turns per second or over exceptionally shallow ground if you’re worried about snagging them up. Moreover, if there is a strong tide running then cast them slightly up tide at an angle (either 11 o’clock if the tide is approaching from your left or 1 o’clock if the tide is approaching from your right.The ideal rate of retrieve will see the lure moving through the water between 4-8″ below the surface – and remember they don’t wriggle or make any noise… Just gliding through the shallows is enough trust me. Another 4lb plus bass caught on a lure that is doing nothing more than being retrieved in a straight line. Is there a better ‘looking’ sea fish in our waters? The reel I’m using is an Abu Garcia Revo MGX 30 – more on that later in the year (a review). I use the Channel Coastal Observatory website here to ascertain the sea temperature. Very interestingly, when you consider that the sea temperature reached 10 ºC in mid-March last year (and the bass weren’t far behind) yet it took until the end of April to be consistently above this figure in 2018, then there must surely be a link between the absence of bass (around many parts of the Country, not just in South Devon) and the sea temperature being 5-6 weeks behind 2017? There is always a reason why a bass over 3lb is caught from a particular area and that reason is generally food related – either in the form of a good ambushing point, patrolling route, knowing there is an abundance of food or just through opportunistic behaviour. All of which points to the possibility that as the sea and air temperature increased rapidly (a sudden spike if you like) so the cuttlefish and sandeels arrived close inshore – hotly pursued by the bass. One thing I will be doing is swapping some of the lures in my box for a couple of ‘sandeel-like’ patterns now that I know they’re about, ready for a few sessions in daylight before I become completely nocturnal! Thank you for your patience in following this blog and for reading this post – I hope you enjoy the coming season and catch lots of bass. DISCLOSURE: If you purchase any lures or equipment using the links contained within this post then I may receive a percentage of the sale as part of an affiliate program. Using these links will not cost you any more then it would from buying directly from the website(s). Next Client Catches – A very nice way to start! Fantastic report Marc. Brilliant to hear the bass are back. I look forward to many more reports over the year. Not to mention spending my time with you later in the year. Keep up the good work. Those session were special last season – good memories and lovely bass.